An unbelievable experience! An experience of a life time! Out of this world! Words can not describe this spectacle of a show that nature displays. The 2010 Adam River Sockeye Run was a record run, and we had the incredible fortune to be able to be there and take it all in. Can you imagine swimming around 400km against the current, not feeding during the whole journey and with only one purpose in mind, to make love and then die, what a way to go. which dumps it's water in to the famous Adams River. Adams River in turn flows into Shuswap Lake. We stayed at a campground in Sorrento called Shuswap Lake Motel and Resort. A bit tight to get in and out with the 5th wheel and some traffic noise, but a really nice setting. Everything nice and clean. Power and water only. The life cycle of the salmon is pretty incredible. Salmon are born in gravel beds in streams 20 to over 1000 km from the ocean. Eggs are laid and fertilized in the fall, the eggs then incubate over late fall and winter. Approximately a month after they have been laid in the gravel, eyes start to show in the eggs. This can happen as early as November - December. It is very important during this period that the water flow is not interrupted. This period has the greatest mortality in the salmon's life cycle. In late winter, the eggs hatch into what is called alevins. This is a tiny creatures with huge eyes attached to bright orange sacs and looks like an alien. Alevins grow rapidly under the gravel for up to four months. Apparently the orange yolk sacs contain a completely diet. The fish is completely protected being in the gravel bed. Alevins turn into a fry in May - June sometime. At this time they are between 2-3cm long, and swim freely. Swimming freely also has its risks, larger fish now consider them good food. They then stay in the river or nearby lakes for up to a year or two. Each species behaves different. Anders watching the Sockeye Salmon in Adams River. Next stage is a Smolt. Smolting is a change in their body which enables the fish to live in salt water and not absorb the salt. Once this process is finished, and the fish has turned into a smolt it is ready to begin its long swim down the river and into the ocean. Once in the ocean the salmon grows very fast and spend a few year here before returning to its place of birth. We spent two wonderful days hiking along Adams River. The highlight was a small creek called Hiuihill Creek, just south of Adams Lake. This creek flows into Adams River. The creek was very shallow, and the fish were out of the water at times. It is a wonderful hike along the creek from both sides of the road. At the mouth of Hiuihill Creek where it flows into Adams River we saw other species of Salmon. From what we were told, some lake trouts come up the river feasting on Sockeye eggs. You will need at least 2-4 hours to hike the Hiuihill Creek, it is a moderate hike with incredible scenery. 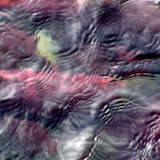 Sockeye Salmon in Adams River, just south of where Hiuihill Creek flows in. If you have a chance to take your family and friends here, please do so. It is something that is so incredible, I know this experience will stay with me forever. Not only that, I will return, just like the salmon. More (tons of them) pictures in our Picasa Album , remember to click on slide show on the top left corner to get the big picture.